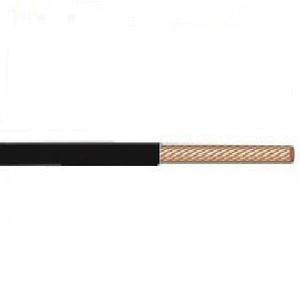 4-AWG Machine tool wire in black color, withstands voltage rating of 600-Volts. This 500-ft long copper wire has 0.06-Inch thick thermoplastic insulation. This wire is suitable for use in internal wiring of electrical equipment in dry/damp locations, heating equipment and lighting fixtures. It is resistant to heat, oil and moisture. It withstands dry temperature rating of 90 deg C and wet temperature rating of 60 deg C. Machine tool wire is UL listed, CSA certified and RoHS compliant.